With its eclectic flavour combinations and gorgeous, wholesome food, warm, friendly staff and inviting atmosphere; the newly opened Flora Bean Gallery Café in Sans Souci is quickly becoming a favourite with locals. Open to the adjoining florist, a gentle floral aroma coaxes you inside the café. The smell of beautiful fresh flowers along with white washed picnic tables, raw wood and canvas banquettes; together with warm earthy tones and bare concrete floors make for a calm atmosphere that reflects the simple, organic nature of the food. The décor acts as a reflection of the food - rough wood finishes, earthy hues and bare walls keep everything simple and organic. 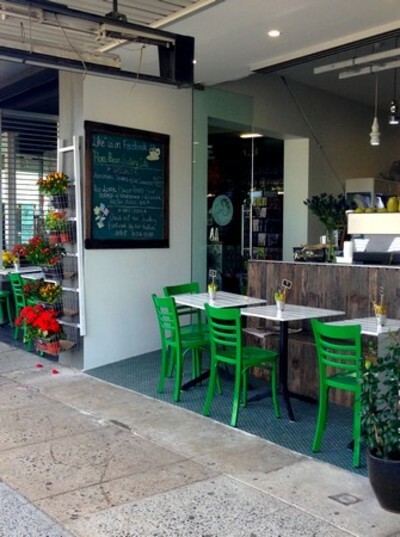 Unlike most cafés, Flora Bean showcases more than just beautiful food. 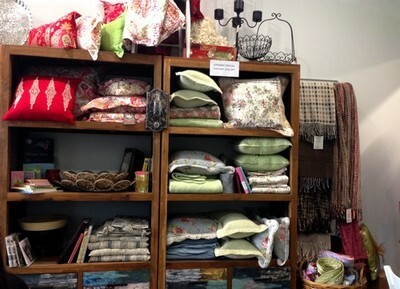 The antiqued wood bookshelf along the back wall overflows with linens, throws, cushions, books, ornate jewellery and handcrafted ceramic ornaments that make for beautifully unique gifts. The tiny space also acts as a gallery, where bare, chipped walls display fascinating and vivid artworks by local artist Alisa Beak. 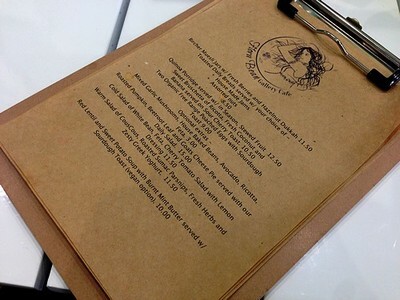 The menu at Flora Bean is small but perfectly formed, promoting the best of quality, organic Australian produce. While the menu at Flora Bean is vegetarian only, non eaters of rabbit food should not be hasty with their contempt, as the café offers a selection of delicious, flavourful and filling breakfast and lunch options, that include more than just salad. While the menu is all vegetarian, it is certainly not dull. Breakfast options include a wholesome quinoa porridge served with sweet and sticky seasonal stewed fruits ($12.50), and an indulgent breakfast bruschetta of banana, coconut and ricotta served on sour cherry toast ($10.50). Lunches at Flora Bean truly showcase the versatility and vibrancy of fresh, seasonal vegetables. While salads do appear on the menu, they are definitely not the run-of-the-mill wilted lettuce, and the soggy tomato kind. The couscous and sumac roasted parsnip salad (11.50) combines the flavours of vibrant mint, coriander and tangy sumac with tender roasted parsnips. 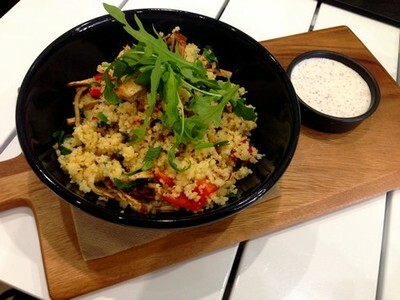 The couscous salad, served warm, is accompanied by a slightly salty, albeit refreshing cucumber tzatziki that really helps round out the salad’s intense flavours. If salad just doesn’t cut it for you, there is also a selection of sandwiches, soups, sausage rolls, burgers and pies. The mountainous burger at Flora Bean comes in two options; either with aioli and Swiss cheese or, for the true devotees out there, there is also a vegan option complete with a slice of soy cheese and a cashew nut based mayonnaise. 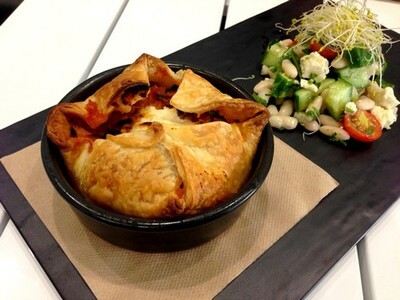 For something really special, that proves that vegetables need not be dull; the roasted vegetable pie ($15) combines roasted pumpkin and beetroot leaf with a creamy goat’s cheese, and encases them all in golden pastry. The puff pastry is crisp and flaky. The vegetables are tender and sweet, and the goat’s cheese is rich and sharp; its tartness acting as the perfect counterbalance to the sweet vegetables. 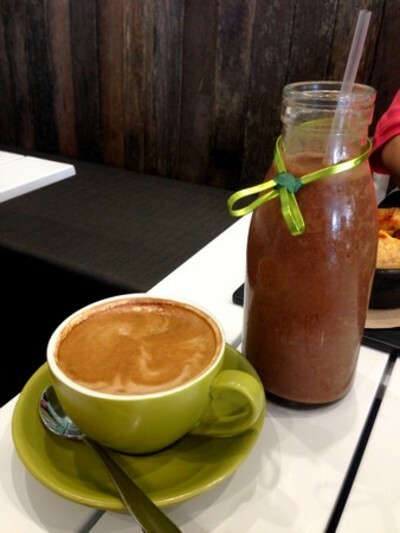 The Mayan chilli and chocolate smoothie - one of many fresh juices and smoothies available at Flora Bean. While the coffee at Flora Bean is delicious, rich, creamy and aromatic; it’s the selection of teas that take pride of place. 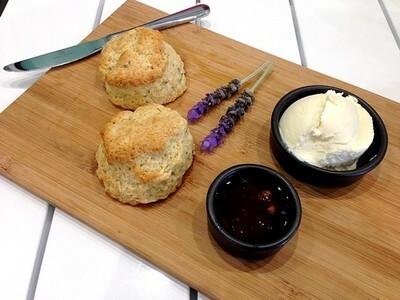 With over a dozen different blends on offer, from the standard English Breakfast, to the exotic Egyptian Ice; these teas make the perfect accompaniment to one of Flora Bean’s gorgeous lavender infused scones ($7) that come served with various house made jams that vary depending on the seasonal availability. 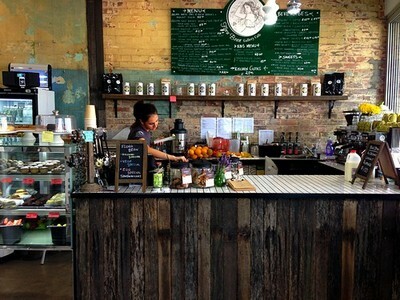 While Flora Bean has been open just a matter of weeks, it is easy to see why its popularity is growing with locals. Providing a delicious alternative to the boring, oil laden lunchtime fare, Flora Bean delivers wholesome, nutritious and delicious vegetarian meals with a focus on local organic foods, without that edge of counter-culture pomp and pretence. Where: 359 Rocky Point Road Sans Souci NSW. Why: Delicious, wholesome meals that will change the way you think about vegetarian and vegan food. Cost: Breakfasts from $9 - $12.50. Lunches from $8 - $15. Drinks from $3.50 - $7.50. Scones, cakes and cookies from $3 - $8.50. When: Open every day from 7am to 5pm. Kitchen closes at 2pm. Good for kids: Yes, there is also a children's menu available.